Excellent Power Increase – Now although I have not had a chance to dyno my truck with the Max Energy tuner Hypertech does claim an increase of up to 176 hp on the cummins. Tow Safe – One of the best parts about the max energy is the fact that even on the highest power setting (Stage 3) you can tow safely. Now I haven’t had a chance to tow my toy hauler with this module I have towed several loads in my heavy duty dump trailer and have yet to see tempratures raise to an unsafe level. No Smoke – Now I know for some of you that might sound more like a con than a pro but personally because of local authorities I’d rather fly under the radar as much as possible and one thing that helps with that is avoiding the smoke out of the tailpipe. Also, another interesting thing to note about the lack of smoke, when I had the Diablo Predator Diesel Tuner on my truck it smoked a ton more. It also had a little more torque on the low end but the same power at freeway speeds. So it seems to me that Hypertech has done a better job of bleeding every ounce of power out of every molecule of fuel rather than just going the route of dumping as much fuel as possible. Internet Updateable – You can always get the latest version for your vehicle. Oversized Tire Calibrations – Got oversized tires? This unit can help! 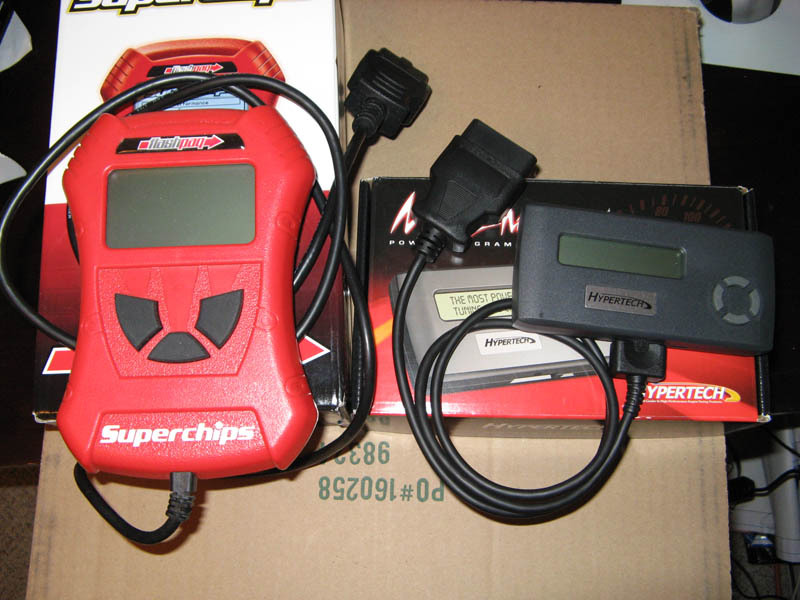 Small Screen – As you can see in the picture the screen is clearly smaller than the Superchips Flashpaq Tuner screen. This is sort of a pain when working with it but makes for a smaller unit when you have to store it in the vehicle. As you can see I don’t really have many con’s. I have been really pleased with the hypertech max energy, and if you are just looking for economy I would recommend checking out the Hypertech Max Energy E-Con. Shop Parleys Diesel Performance for all your performance diesel upgrades. This entry was posted on July 22, 2008 at 5:42 am and is filed under Diesel Performance Chip, Diesel Tuner, Uncategorized. You can follow any responses to this entry through the RSS 2.0 feed. You can leave a response, or trackback from your own site.